I never know where I’m going with silent films. Their unpredictability transforms me into an open-mouthed viewer, wondrous in a way I rarely experience with films made later. Was it the Code that made things more predictable, dictating moralistic and uplifting tales? After seeing “Sunrise,” I think it was the reliance on dialogue at the expense of pure visual experimentation. There’s nothing more indulgent than going out for the evening to see “Sunrise” in the theater with a live band at a point in the semester when I really should be grading papers and preparing a lecture. 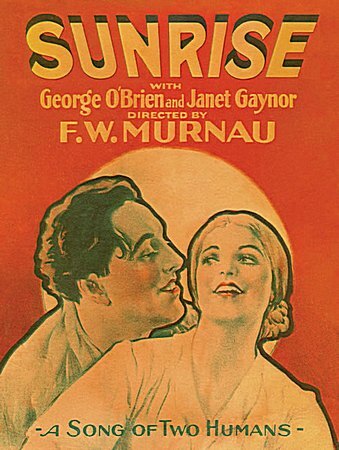 Directed by F. W. Murnau, who’d filmed the Expressionist classics “Nosferatu” (1922) and “Faust” (1926) in Germany before coming to Hollywood, “Sunrise” is pure fable. The story seems slight, even dull in synopsis form: The Man (George O’Brien) is having an affair with a glamorous Woman From The City, who urges him to murder his Wife (Janet Gaynor) by taking her out on his boat and drowning her. After he finds he can’t do it, O’Brien and Gaynor run off to The City where they find themselves falling back in love while partaking of urban wonders — having their photo taken, visiting an amusement park, dancing the “Peasant Dance” to the delight of the spectators. They become like newlyweds again — childlike, happy like they used to be. But if it sounds predictable, there’s nothing easy about it: it’s Freudian, archetypal, essential, surprisingly raw. 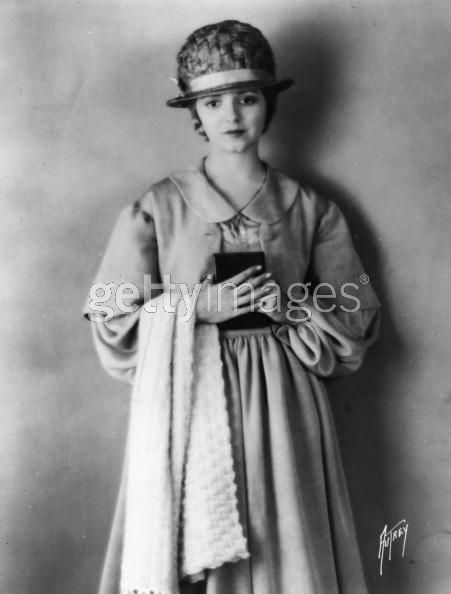 Janet Gaynor has the tiniest little face with a helmet of blonde hair pulled back into a bun, like a doll; hulking George O’Brien’s head and hands appear at least three times as big as hers. Shots of him protecting her or tossing her as if she’s weightless show us his potential brute power over her; yet her purity and her enormous black eyes seem to hold true power over him. In the end, “Sunrise” is a fable about love and reconciliation the way that Charles Laughton’s “Night of the Hunter” (1955) is fable about childhood terrors and motherly protection. The film could melt even a cynic’s heart, but it also leaves you feeling as if you’ve had an unexpected and somewhat painful breakthrough in therapy. With a couple like this showing up in The City, you anticipate some kind of city mouse/country mouse narrative — decrying the dangers and corruptions of the city and celebrating the country’s simple virtues. But that’s some other movie. In fact, they rediscover their love and childlike innocence in the city. (And who wouldn’t, with that awesome amusement park — let me just say that I want to play a game in which you throw a ball through a hoop and a real little pig comes rolling down a slide.) As a viewer you find yourself bewildered by all of this — pleasure in Gaynor and O’Brien’s newfound love, confusion about where the story is going, wonder at urban delights — such that you start to feel like a child again yourself, and you find buried in you a deep, dark fear that somehow their happiness might have to be ruined. 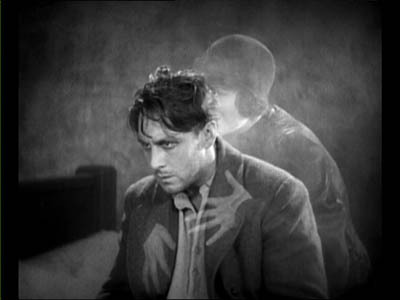 Murnau made great use of camera trickery — from composite shots to double-exposure. When The Woman From The City seduces O’Brien with tales of the city, the sky above their reclining bodies transforms into shadowy scenes of decadent pleasure. When he thinks of her later and thinks about murdering his wife, he is grasped by a ghostly version of her, surrounded by images of her face. But, then, “trickery” is the wrong word. This isn’t a film that delights in the camera for the camera’s sake, or that privileges style over substance. 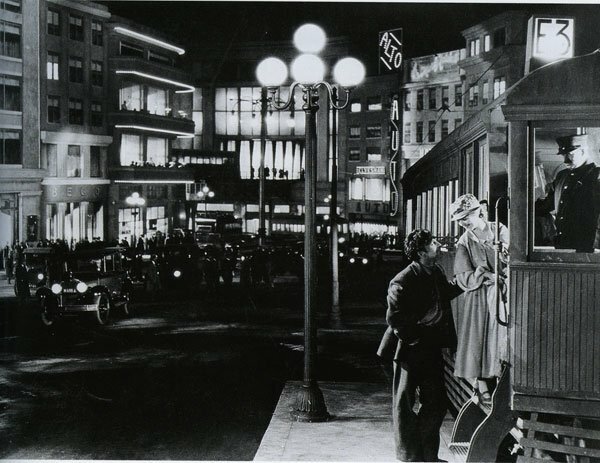 Rather, Murnau’s eery understanding of what made for a good, memorable shot — and his ability to mix action scenes and moving cameras with quiet, magical closeups of Gaynor and O’Brien — demonstrate an unbreakable focus on conveying meanings through images that transcend words. Magic. Seeing “Sunrise” took me out of myself, away from the papers and email and PowerPoint slides. Oh, that we had more chances to see silent films on the big screen, with live accompaniment, with rapt audiences that whoop at the end. It’s not just that their narratives are unpredictable (though that would be enjoyable enough). Silent filmmakers created visual images that tapped into one’s psyche, doing far more than the thin storyline purported to accomplish.